Week 8 | Fox Walkers at Whatcom | Shelter Building and Garden Tending! Sunny skies and warmer temps made for a beautiful day at Whatcom Falls Park last Friday. Pat and I didn’t anticipate such a warm day, so we were prepared to get a fire going in the grill adjacent to the Small Shelter at the park. When we noticed the clear skies, though, we decided against it. The Fox Walkers were still pretty “fired up” about batoning firewood, however, so we spent a bit of time in the morning getting some nice wood chopped up for next time! Despite the cooler temperatures these days, there are still some active yellow jackets around. In fact, we noticed a nest inside the overhang of the park shelter. Luckily the yellow jackets were not aggressive when we encountered them, so we were able to move away from the nest area without any stinging incidents and we even spent a couple of moments observing the yellow jackets from a safe distance. Hopefully this peaceful encounter gave the Fox Walkers some assurance that these wild winged creatures aren’t always aggressive and can actually be appreciated from afar. Pat and I realize that there is still quite a bit of apprehension over yellow jackets amongst this crew, so we're doing our best to be sensitive towards this issue while at the same time refraining from perpetuating an entirely fear-based mentality around wasp encounters. Sometimes there are "squeaky mice" in Melissa's flute! We found lots of heart-shaped leaves at "Heart Home"
Working on our shelter . . .
Our theme was shelter building, and in our story Moon Bird and Running Deer decide to set up a primitive shelter to sleep in while they’re out on their backpacking trip. Unfortunately, the shelter that they build doesn’t hold up well to the wet weather, winds, and their muddy surroundings. After a very uncomfortable night of sleep, they encounter a silly squirrel by the name of "Douglina". Douglina teaches them the importance of considering the “Five W’s of Shelter Building” : Wood, Weather, Widowmakers, Wigglies, and Water. Douglina the Squirrel also invites Moon Bird and Running Deer to climb up a Cedar tree and peek into her drey (squirrel shelter). Moon Bird and Running Deer learn from looking at Douglina’s dray that a good shelter has lots of dry leaves and moss in the inside to help keep you warm. The shelter itself is made of strong branches that are covered with a latticework of smaller branches. Then on top of these branches is an enormous pile of leaves, ferns, bark, etc. to keep the shelter waterproof and insulated. This outer layer of debris is incredibly dense and deep, which is key to making a good shelter that protects you from the elements. 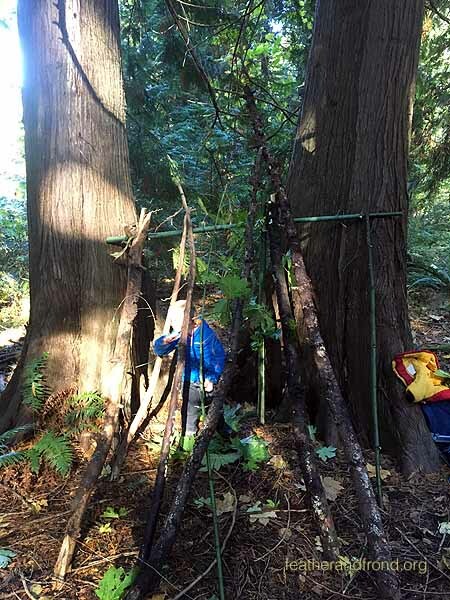 Moon Bird and Running Deer were super grateful for the teachings that Douglina the Squirrel shared with them about shelter building, and they used these lessons to make themselves an incredibly waterproof and cozy primitive shelter! Gratitude for the wisdom of the squirrels! After story, the Fox Walkers shape-shifted into squirrel themselves and sought out a good place to build a shelter of their own. We considered the 5 W’s and found a spot under a pair of Cedar trees which already provided quite a bit of coverage. We worked on our shelter for most of the day, collecting sturdy branches for the structure, smaller branches for the lattice work, and lots and lots of leaves and other debris for the inside and outside of the shelter. Despite all of our efforts, the reality is that a solid shelter takes many, many hours to build! But at least we were able to create a solid foundation. We named our shelter "Heart Home" because of all of the heart-shaped leaves that we found nearby. Some of the Fox Walkers were inspired to set up “gardens” surrounding Heart Homes, where they tended to a variety of fruits and veggies. A very passionate crew of gardeners emerged, it was really sweet to observe the creativity and imaginative play amongst all of them! We’re grateful for another fun day at Whatcom Falls and we look forward to this Friday’s adventures!